Have you tried logging-in to your web application, then fixed your code for several minutes or an hour and when you refresh the page, it redirects you back to the login page? Are you tired of refreshing the page just to keep your session alive? Is your web application not designed to kill idle sessions? Well, if yes, then it is not part of our topic today. This small plugin for Firefox will save your work. It can be configured to reload the page (selected tab in Firefox) for a certain time interval so that you don’t have to reload it manually. It can be useful in maintaining a session when developing web applications. Choose Enable – you can also select the time interval for every reload. 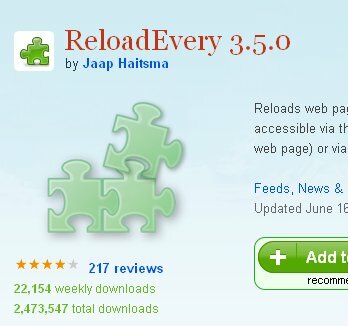 This entry was posted in Web Browser, Web Development and tagged firefor plugin reload every, firefox refresh page, firefox reload page, refresh every, reload every, reload page. Bookmark the permalink. Yeah that’s right! I’ve been wanting for this kind of feature before since I’m annoyed with my very own Web App asking me to login over and over again. I wish there is an IE version for this, but its sad that I can’t find one that works for IE6 and up. Thanks for visiting Techie Inspire. I’ve seen you blog and StumbleUpon on your article about finding Windows XP CD Key.